I love peyote. I love even-count flat peyote. I love trying this stitch with different beads. 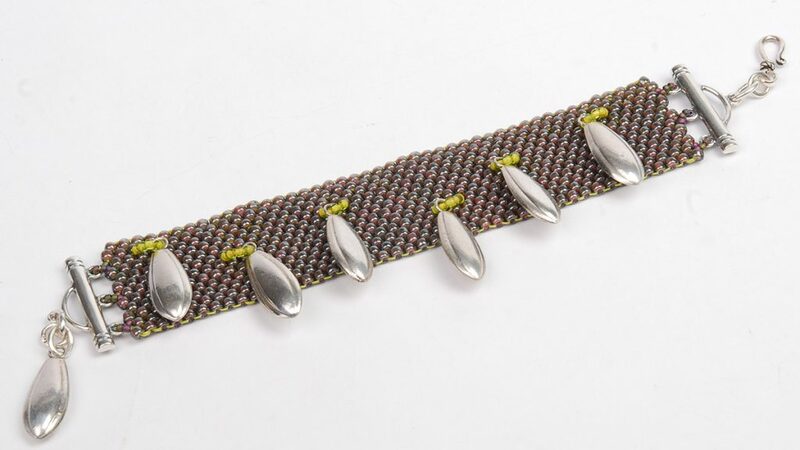 I love peyote bands that are plain and let the beads do the talking. Now more than ever, among a stack of bracelets, these simple bead-woven bracelets work into the mix really well. 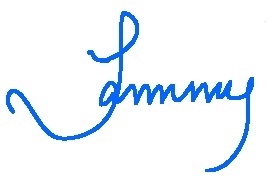 Need to brush up on this stitch or maybe you’re intrigued? Check out Melinda Barta’s Peyote Stitch Companion DVD for all the basics and some great variations so you can expand on this tried and true old friend of mine. 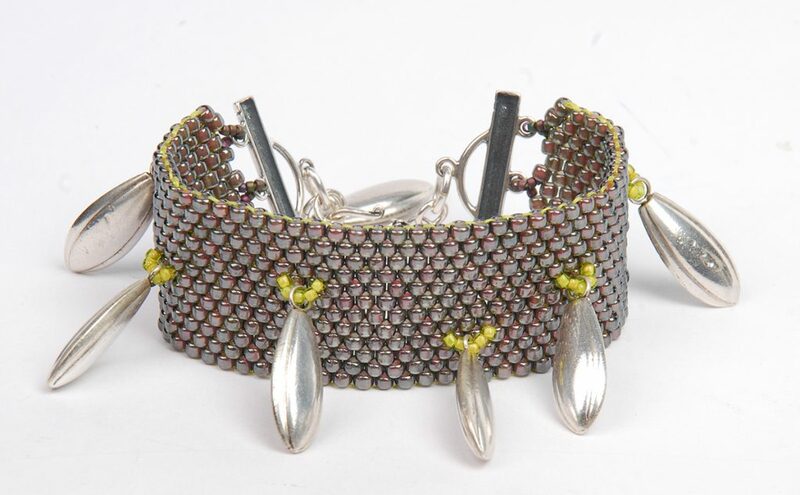 This go around, using some newly purchased size 8/0 beads, a color tip from Mary Tafoya and her color theory workshop, I’ve gone back to this “standard,” with contrasting bead colors, 12-beads wide (by however long is needed), and a fabulous sterling silver multi-strand clasp design. Kicking it up a notch, once stitched, I had the perfect base to add in a Hill Tribes silver charm fringe. Here is the final outcome, and to follow are instructions on how to make one of your own. Step 1. 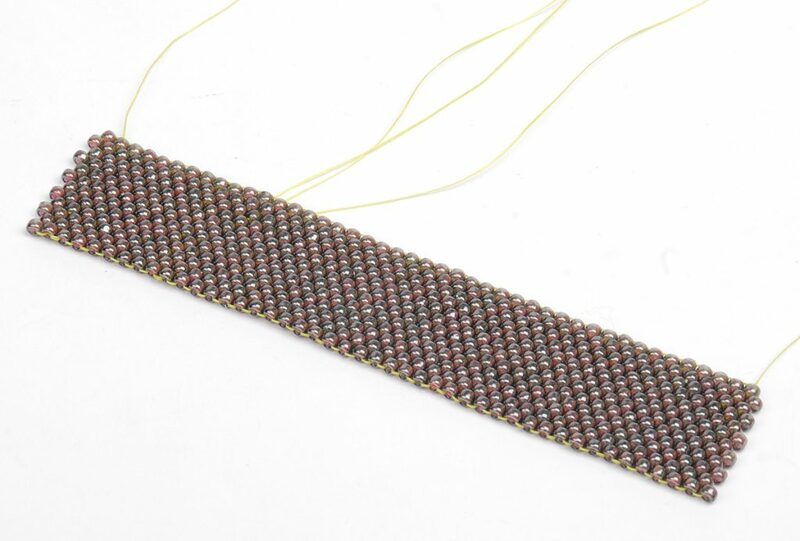 Following along the basic peyote bead weaving instructions, create a strip of peyote bead weaving, 12-beads wide and about 6 inches long. 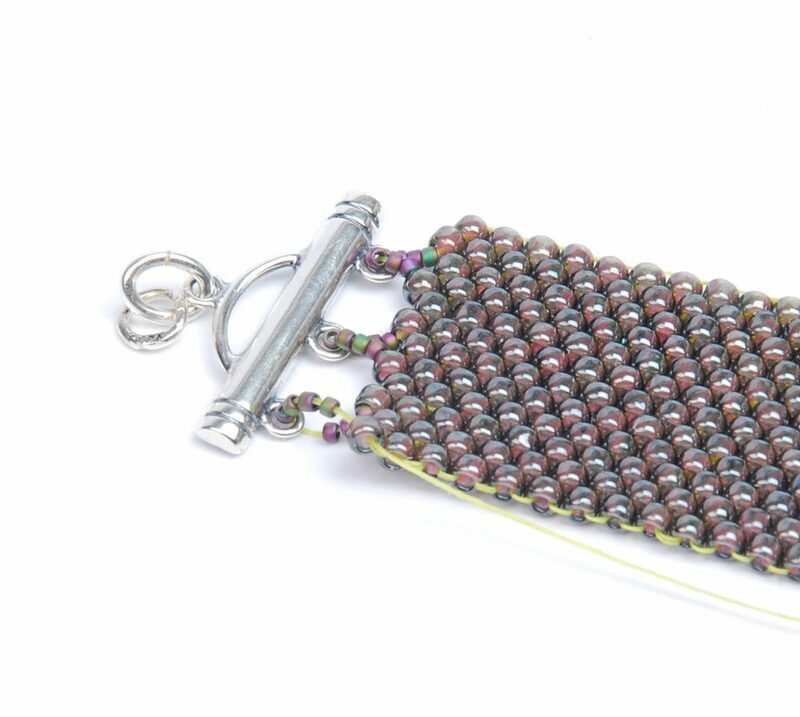 Line up the clasp with the bead weaving to see if the length will work for you. Step 2. Make sure both ends have the same line up of beads so the clasp can be connected and even on each side. Weave your needle so it exits an end bead. 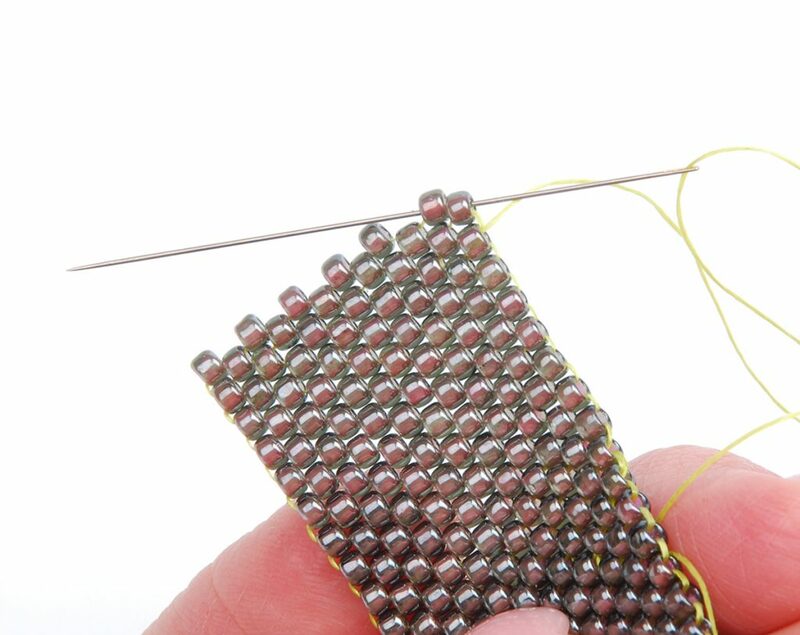 Pick up 7 size 15/0 seed beads, the loop on one end of the clasp, then pass the needle through the next bead in the last row of the bead weaving. Step 3. Repeat Step 2 to complete adding loops of size 15/0 seed beads, connecting the clasp to the peyote woven strip. Repeat for the other end of the peyote woven strip. Step 4. 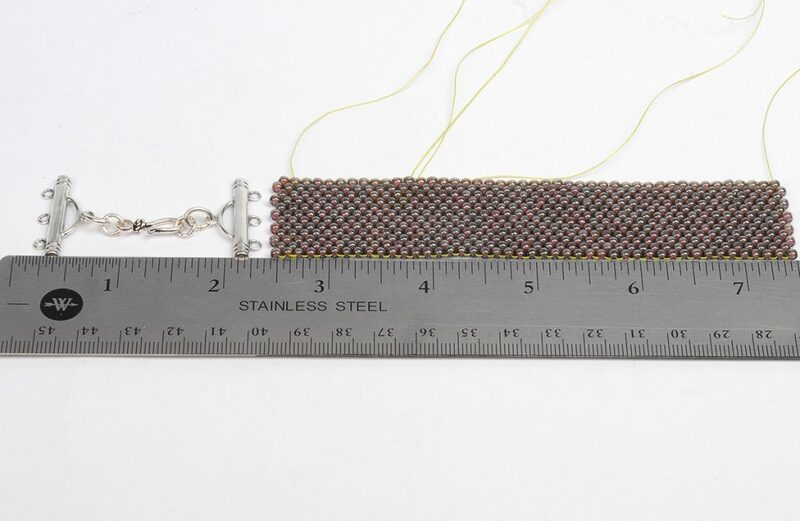 Weave your thread (or start a new one) into the bracelet. 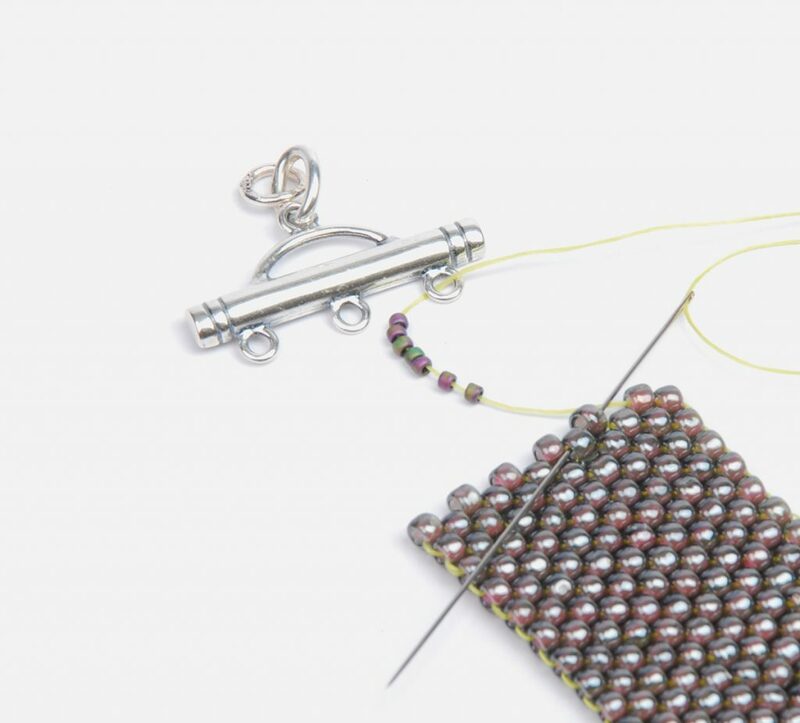 Exit any bead so your needle exits toward the “bottom” of the bracelet. Pick up 5 size 11/0 seed beads and the loop of your Hill Tribes silver pendant. 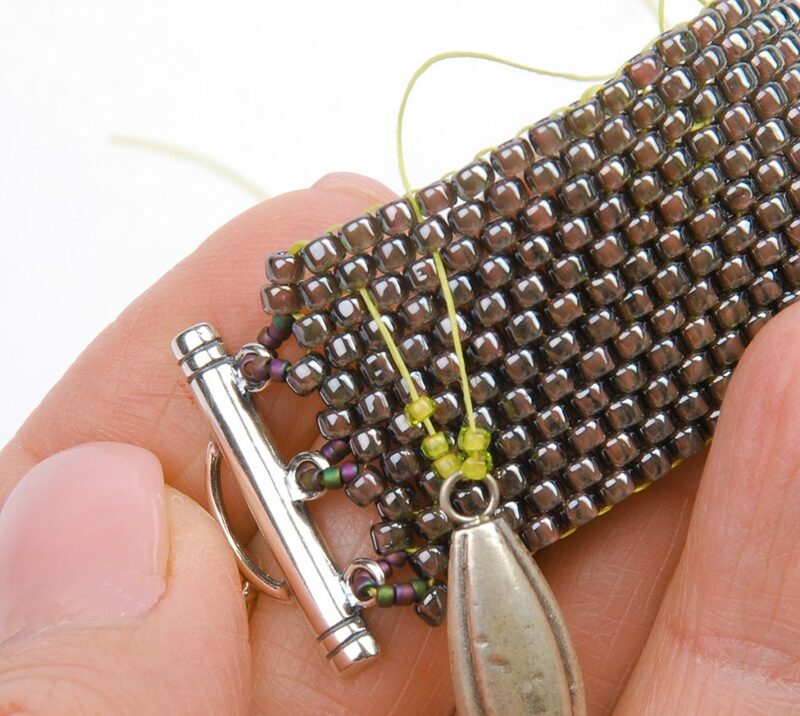 Skip a bead then pass the needle into the next bead, working toward the top of the bracelet. Design tip: You can pass the needle through the next bead in the row, stretching the “fringe” for more of a point then a curve. Repeat to add as many Hill Tribes silver fringe drops as you’d like. Weave in any thread ends then trim close for a neat finish. 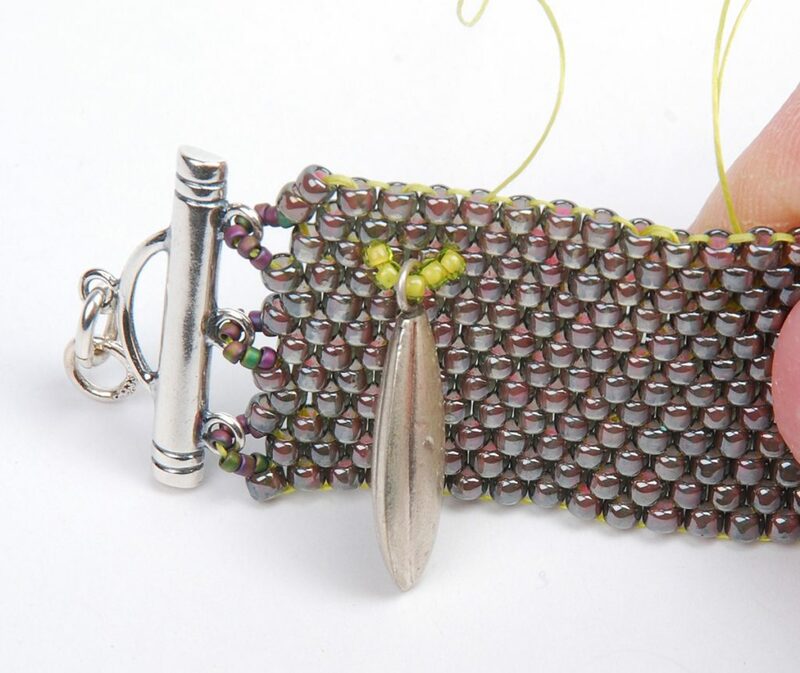 I hope you are inspired to try this bead-weaving design and then add your own spin and flavor. Please share your iteration either in our member gallery or by leaving a comment.